Do you have a company office manual? Most small businesses do not, yet most large (fortune 500) companies do. What does that say about the importance of policies and procedures to your organization? One thing is clear, if you want to grow into a large enterprise, then eventually you will need a company office manual to provide the instruction and guidance your employees require. Over the years, large companies have learned to create an company office manual that documents important recurring business tasks. Otherwise they find themselves re-inventing the wheel with every new employee. When it comes to training you really only have two decisions to make: either provide training using an instruction manual, or leave the new employee to figure their job out on their own (one mistake at a time). Which method are you using? Your policies and procedures act like an instruction manual for your company. They provide basic internal control, a basis for training, and a great place to start for process improvement. A process map or description of the process you use to make money. References to standards, laws, and regulations that must be achieved. How Is a Company Manual Used? Have you ever ordered a kit that needed to be put together? It usually comes with an instruction manual that includes an explanation of the parts (inputs), the tools needed, an exploded diagram (like a process map), and a picture of the finished product (output). I usually refer to the exploded diagram and the final picture to ensure I am putting the product together correctly. What about your company? Do your employees have the information they need in an office manual for your key business processes? Having a clear picture of the finished product helps your employees understand what the output should look like. This allows them to catch mistakes and fix them before they are passed on to the next person as waste. Examples of outputs include charted process metrics, measurements, pictures, mated parts, or anything that provides instant feedback to the employee. Small businesses that want to grow into a large enterprise need a company office manual to provide the coaching and guidance that each employee needs to do their job. Your instruction manual acts as an important training aid, guiding the worker, and helping to reduce mistakes. Writing Company Manuals does not have to be difficult. Now you can save yourself the time it takes to research laws, regulations, and standards. 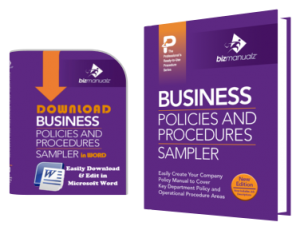 Download free sample company policies and procedures as a guide to save yourself valuable time, trouble and the stress of writing your own procedure manuals.